Tables always need to face the front. Learning an individual activity. Classrooms need to look the same each day. Learning always happen at fixed times. These are just a few of the traditional assumptions that are examined in the article Challenging Traditional Assumptions and Rethinking Learning Spaces written by Nancy Van Note Chism and published in Educause. Having looked at the barriers and opportunities to creating different learning spaces Nancy then provides some fascinating examples of intentionally created spaces and how they better reflect the learning needs of students today. By the way what do you think about the informal seating at City Campus in East Northumbria University in the featured photograph? 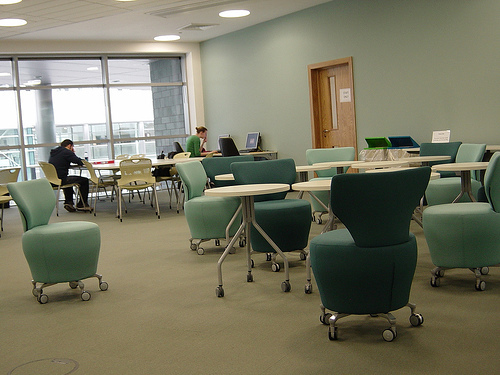 It shows a multipurpose area for independent study in which students can choose from a variety of settings using different seats and table tops. They can opt for different views and locations depending on their needs. The room is fully wireless enabled and the colour palette is fresh and cool, with heaps of natural light. Makes you want to go there!